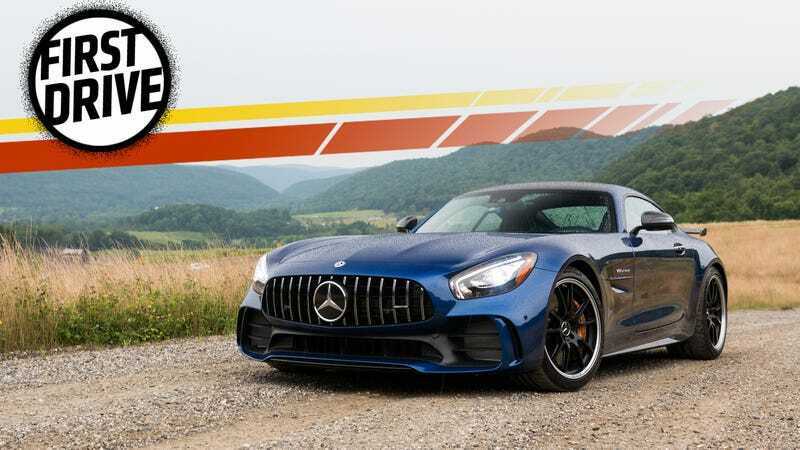 On a twisty backroad in Connecticut, behind the wheel of the new 2018 Mercedes-AMG GT R, I followed a vehicle doing the posted speed limit of 55 miles per hour and thought to myself, “should I pass?” I had absolutely no reason to. Not one. But I did it anyway. Signal left, lean on the throttle, pass the car on the right while emitting rips, snarls and evil voices from the tailpipes. I did it because I could. And it felt good. That’s what this car does to you. And it’s the most dangerous drug I’ve had in a long time. The AMG GT R is the hopped-up race version that isn’t-yet-a-Black-Series-version of the AMG GT—Mercedes’ flagship sports car. And to understand the AMG GT you’ve got to understand the car it replaced—the SLS AMG. 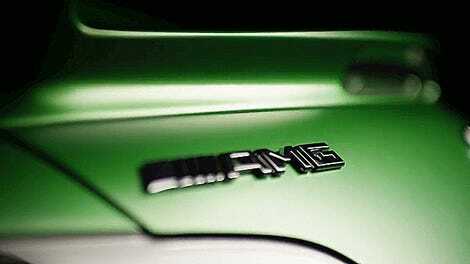 The SLS AMG, introduced in 2010, has more in common with a top-fuel dragster than a Mercedes-Benz. That car had a 6.2-liter naturally-aspirated AMG engine—one of its best ever—with an airport runway for a hood and a set of idiotic gull-wing doors. Unbelievably, the SLS AMG had even less interior volume than it did trunk space, but what that did for the driver was provide the absolute best “cockpit” I’ve ever experienced—a low, hunkered-down seating position below the body line, horrendous visibility, and a shitload of power beneath your right foot. Thankfully, some of of the traits that defined the SLS AMG made it to the AMG GT R. But, since we’re talking about Mercedes, they of course did away with the features that made the SLS AMG impossible to live with and added way, way more of what made it so juvenilely fun to drive. The AMG GT doesn’t look as regal as the outgoing SLS—it’s smooth, supple and more slippery looking compared to Mercedes’ last hero car—but what I love about the GT R is that all the go-fast bits strapped onto it disrupt the silkiness of the exterior in the best way possible. The best view for this is the rear, where the wider fenders, bigger air vents, and diffuser beautifully clutter the back end—not to mention the titanium exhaust that exits in four different spots, or the massive wing. For all the visible aero components at the back, there’s an equal amount that you can’t see towards the front. Towards the outside of the front fascia lies an air curtain that feeding wind into the wheel arches for better cooling. Computer-controlled louvers sit behind the front fascia and can open and close within a second depending on the car’s temperature. The real kicker is an active carbon fiber fairing underneath the body, just forward of the engine, that can lower 1.6 inches to help stick the car to the road. My favorite exterior feature, though, isn’t aero related at all—the wheels are a matte black center with a polished lip that remind me of the AMG Hammer from the ’80s. So cool. On the inside, the driver is rewarded with a cabin that’s all Mercedes. The knobs, switches, and surfaces all smell, feel, click and clack in the most satisfying and tactile way. 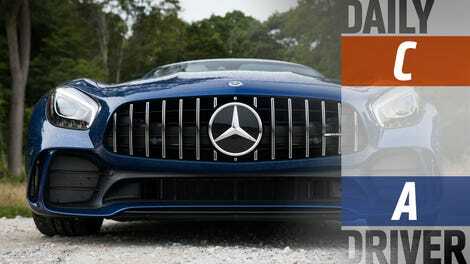 It’s everything you’d expect to find in a Mercedes that costs north of $180,000. That is, until you see a giant YELLOW knob mounted directly in the center of the dashboard. That’s the adjustable traction control, and it’s the biggest cue from inside the cabin that you’re not driving just another Mercedes. This knob gives the driver nine different levels of slip so you can drift the GT R to your heart’s content without killing yourself. Or at least, that’s what I think it does. The engine is twin-turbo’d, but you wouldn’t know it. Besides the slightest hiss out the exhaust and the faintest amount of turbo lag below 2,000 RPM, this engine behaves with the smoothness and linearity of its naturally-aspirated predecessor. The power is everywhere. Displacing just 4.0 liters, it’s hard to believe how it makes all 577 HP and 516 lb-ft of torque—until you look at how the engine delivers boost. The two turbos, mounted on the inside of the engine’s V to improve response, squeeze 19.6 pounds of boost. Good lord! A Nissan GT-R runs closer to 12; 20 psi is immense. And you’d think with all that boost and so little displacement it might behave like a tuned Mitsubishi Evo, but it’s the complete opposite. Getting on the throttle is never scary. There is no “woosh”, no surge of power that catches you off-guard. It’s this predictability that gives you the confidence to go fast, and it’s this speed that makes the GT R so dangerously fun. Even though the GT R has active damping, you won’t completely forget there’s a carbon-fiber torque tube, two diagonal braces in the engine bay that stiffen the front end and a carbon-fiber tunnel cross brace—especially when you hit a bump. For the most part the steering and suspension are bearable even on rough New York City streets, but I don’t think too many of these will be doing taxi duty or making Postmates deliveries around the five boroughs. There is one feature on the GT R, however, that makes street driving an absolute joy—stop/start. Imagine this: You pull up to a stop light in the GT R with stop start activated. The car shuts off, and the people in the car next to you are wondering what that crazy wing and gaping hood vents mean. Hit the exhaust button, which you can do while the car is off in comfort mode, and mash the throttle when the light turns green. The car roars to life with an immediate surge of power, filling everyone’s ears with “pssssshtWAAAgghhhAAAAAAAAAUUUUUUUU.” It’s like performing a sneak attack on unsuspecting drivers and it’s so, so much fun. Unlike the SLS AMG, which was only fun in a straight line, the GT R is built for the corners. Yes, you can have a blast ripping 0-60 times between stoplights, but that’s not where the GT R shines. You suddenly forgive the stiff ride when you’re mid-corner and realize how much more grip there is to be had than what you’re experiencing. Seriously, I’d love to tell you what this car feels like “at the limit” but it basically laughed at me every time I tried to come close. Corner approaching with no traffic? Go ahead and engage sport mode, give it your all, and at corner exit you’ll realize you just did the equivalent of poking a bear in the stomach. Even on straightaways—downshift, lean into the throttle, go up a gear and you’re in jail. Double the speed limit happens in an instance, and your license would get taken away even faster than that. There’s just no way to get a feel for the behavior on public roads which, sadly, is only where we were allowed to test it. But you get a sense, while driving the GT R as a law-abiding mortal, how truly capable and breathtakingly fast a machine this is. Feeling the power at the top of second gear gives you an idea what it might feel like at the top of fifth. Modulating the carbon ceramic brakes, which are usually like on/off switches, gives you an idea how you’d be able to finesse them on the track. And the aero, as crazy as it may look, will likely make a huge difference at 150 mph, you just need to get somewhere safe to do that. The GT R is one of those cars that forces you to be a better driver—one that is more aware of their surroundings—because your surrounds come at you so, so much faster. You wonder if there are leaves or loose stone around the corner that could upset your grip and punt you into the guard rail, or if oncoming traffic will be slightly over the double yellow line that would force you to make a quick correction that could upset the car. You even think about your response to “do you know why I pulled you over” in case you pass a squad car shooting radar in the bushes. For all of these reasons, the GT R is an awesome machine. Awesome to look at, awesome to drive, and just awesome to behold- especially with a $186,765 as-tested price tag. Just don’t try to be awesome on the street. Take it to a track where it really belongs. Small and stiff but at least it's refined. Just one big bad influence.